A true classic, this seal and send wedding invitation features a cherub at the top of lavish vintage frames. The gray flourishes will remain gray. Frames and wording are printed in your choice of colors and fonts. 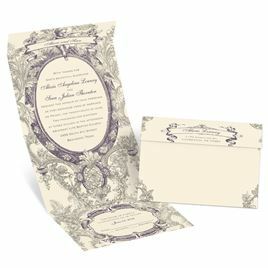 The invitation features a perforated response card printed with your return address on one side and your response wording on the other. Guests fill out the card, remove it and return it to you (be sure to place a stamp on the card for guests' convenience). The price includes printing your wording inside and your return address on the outside flap.